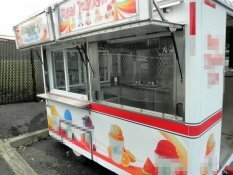 Ford Ice Cream Truck for Sale in New Jersey!!! Live up your business dream and start making your signature ice cream! Start with this 1989 Ford E350 mobile creamery unit that has 52,445 miles on its engine and 7' of inside standing height. Further details and features are shown down below. 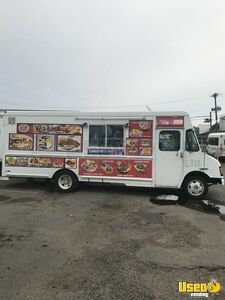 GMC Food Truck for Sale in New Jersey!!! Be confident with your signature flavors once you roll on to the street food business scene! Get this 1995 GMC Vandora food truck to get started! The kitchen inside was installed in 2005. See more details down below. 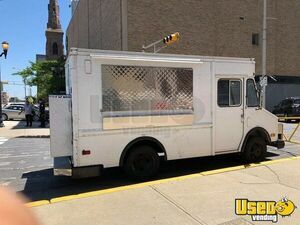 UMC Food Truck for Sale in New Jersey!!! The road is open for your original street food business! 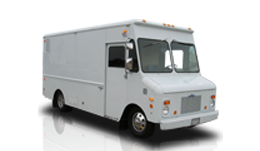 Get started with this 1993 model UMC Utilimaster Aeromate food truck that has 62,000 miles on its engine. More details can be seen down below. 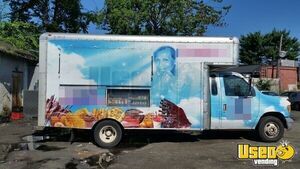 Nissan Food Truck for Sale in New Jersey!!! In need of an awesome unit to begin your dream mobile kitchen set up? Look no further! 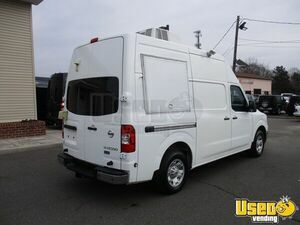 This 2013 model Nissan NV2500 food truck is ready for you! See more details below. 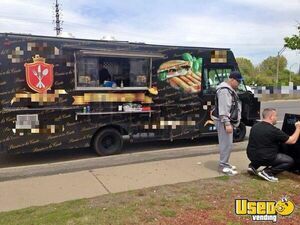 Freightliner Food Truck for Sale in New Jersey!!! 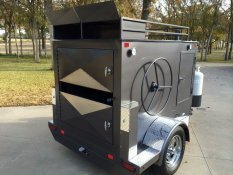 This awesome mobile kitchen is your ticket to enter the street food business community! 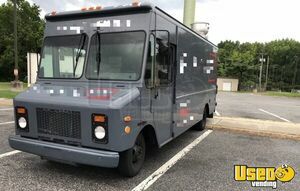 Get this 2001 model Freightliner food truck now! Fair condition, needs some handyman type work. Mileage is 220k. The kitchen was installed in 2015. See further details below. 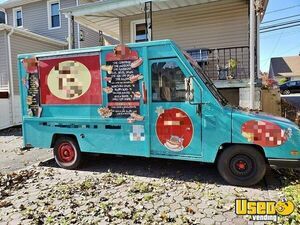 Vintage 1977 Ford Ice Cream Truck for Sale in New Jersey!!! Mix up modern day flavors with retro vibes! Start your very own on-the-go ice cream business with this vintage 1977 model Ford econoline ice cream truck that has 128,000 miles on its engine. More details can be seen below. 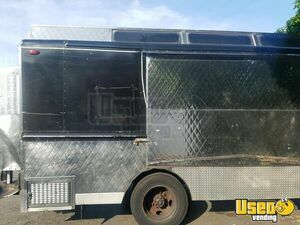 23' Chevy Mobile Kitchen Food Truck for Sale in New Jersey!!! 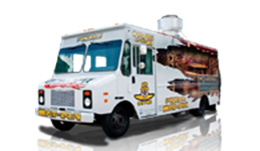 One of the hottest food trucks in the market is available for purchase today! 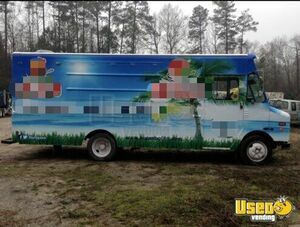 Don't miss out on this 23' long 1999 model Chevy step van mobile kitchen food truck that has 74,456 miles on its engine. This is featuring an equipped 2018 build kitchen inside! See more details below. Don't waste time - start your mobile food business right away! This 1999 model Chevy food truck is a great unit to start with! Has appx 95k miles on it. 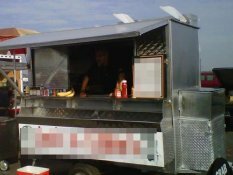 Check out details and features of this food truck below. 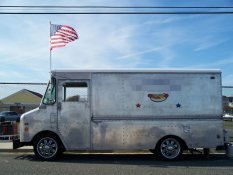 Chevy Grumman Food Truck for Sale in New Jersey!!! 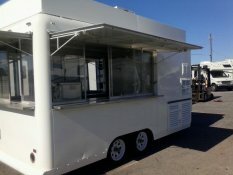 Grab yourself an awesome mobile food unit for your food truck business venture! Get this 1987 model Chevy Grumman food truck that has as a brand new Kitchen and brand new fire suppression system! All inspections come with this food truck! Check out more details below. 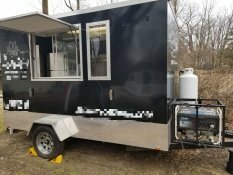 Workhorse Food Truck for Sale in New Jersey!!! Get on the business road with your own mobile food business! 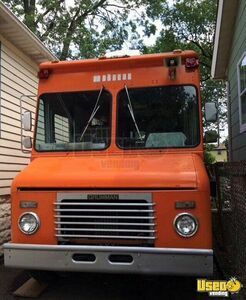 Start with this 2002 model Workhorse P42 food truck that has 145,000 miles on its engine! Check out more details below. 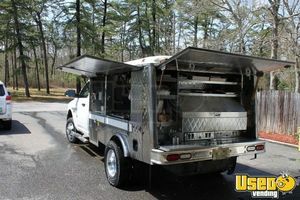 Grumman Olson Food Truck for Sale in New Jersey!!! Always ride with your own mobile food business! 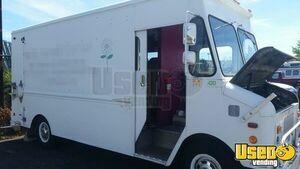 Get this 1998 model Grumman Olson food truck now and start your original food truck business! It has 27,000 miles on its engine and it has a kitchen inside that was installed in 2017. See more details below. 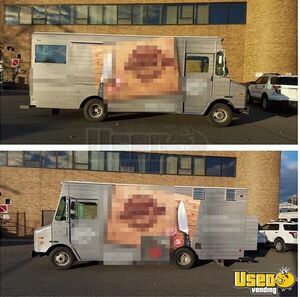 Need a truck to put all your mobile food business ideas on? get this 1986 model GMC food truck now! 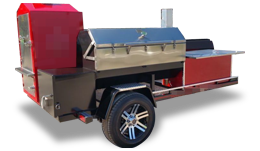 More details and features of this mobile food unit are shown down below. 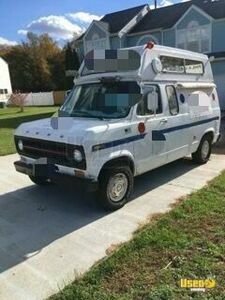 Grumman Food / Ice Cream Truck for Sale in New Jersey!!! It's the perfect time for an awesome food truck upgrade! Get this awesome deal now! This is a 1993 model Grumman Olson food / ice cream truck that has 136,000 miles on its engine! See more details and features below. Never waste a moment and get started on an awesome mobile food business adventure! This 2006 model Chevy food truck is in very good condition and it's ready to help you out! Has 96k miles on it. See more details below. 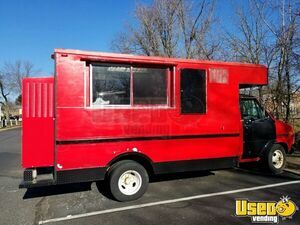 2000 Blue Bird Food Truck Rolling Kitchen for Sale in New Jersey!!! 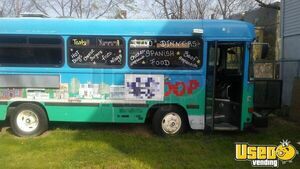 Make your own path to success with this 2000 Blue Bird 22 passenger shuttle bus fully converted into kitchen on wheels! This is a great food truck to start a mobile food business with. More details shown below. 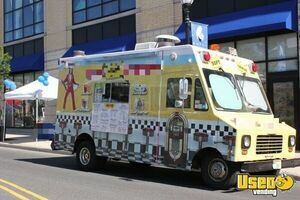 Grumman Food Truck for Sale in New Jersey!!! It's Your Turn to Serve Great-Meals-On- Wheels! 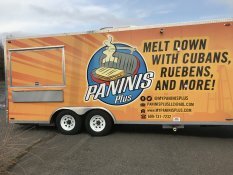 Check out this awesome Food Truck now! This is a 1998 model Grumman Food Truck that has 6,000 miles on its NEW engine. More awesome features can be seen below. 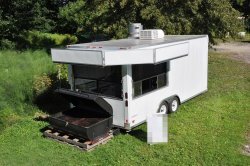 Chevy Food Truck Mobile Kitchen for Sale in New Jersey!!! 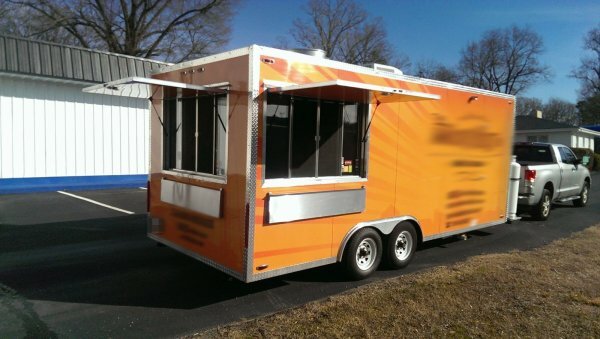 Get this equipped Food Truck that will get you on the road to success! 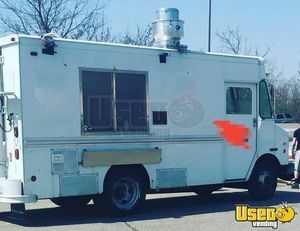 This is a very good condition 1979 Chevy Grumman BF35 Food Truck. More features of this unit can be seen below. 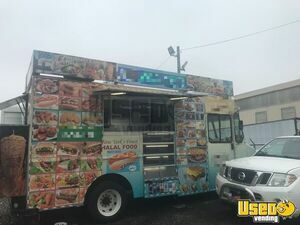 2017 Dodge Lunch / Canteen Truck Turnkey Business for Sale in New Jersey!!! It's new and ready to serve from breakfast to dinner! This nice 2017 model Dodge Ram 3500 dually Lunch / Canteen Truck that only has 11,000 miles on its engine. Check out more details below! 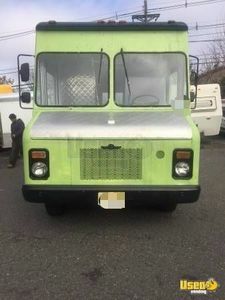 For Sale in New Jersey - This is a 1981 Chevy Kurbmaster Food Truck that has 80,000 miles on its engine and 7.8' of inside standing height. Check out more details below of the truck below. 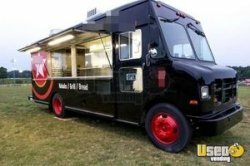 GMC Food Truck Mobile Kitchen for Sale in New Jersey!!! For Sale in New Jersey - This is a 1999 GMC Grumman Food Truck that has 165,000 miles on its engine and 7.11' of inside standing height. More details of the truck shown below. Ford BBQ Truck for Sale in New Jersey!!! For Sale in New Jersey - This is a 1998 Ford E350 BQ Truck with 242,000 miles on its engine and it has 7.20' inside standing height. More details shown below. UsedVending is great, Melissa was very helpful and supportive. UsedVending is great, Melissa was very helpful and supportive. she very patient with me and soooooo helpful. I cant say enough about her, she so good, her attitude her cheerfulness, on the phone. and she stuck with me through he whole process. Melissa I can't thank you enough. Used Vending is 2 for 2, There is no better place to sell. Used Vending is 2 for 2, they sold my food truck a few years ago and now my trailer. Well done UsedVending. There is no better place to sell. 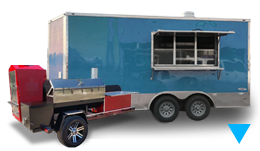 I would definitely recommend working with USEDvending to purchase a food truck or trailer. I worked with Wendy and she was very professional! Her promptness in responding to my questions and getting the correct information back to me made the process easy and go smoothly. 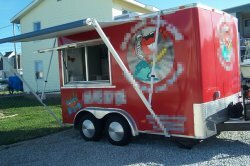 I would definitely recommend working with USEDvending to purchase a food truck or trailer. Thanks again! It was an extremely pleasant and easy experience. 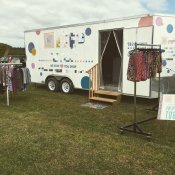 I worked with Wendy to sell my mobile fashion boutique. It was an extremely pleasant and easy experience. I was worried at first but all doubts have left my mind after selling to a top notch buyer. I couldn’t be happier if I tried. I couldn’t be happier if I tried. Very happy and satisfied with the service from Used vending as well as who I bought my trailer from. Very easy process and an excellent trailer I got as well. Thank You all so much. It gonna be perfect for my Lularoe business. I plan on working with Used Vending in the future as I continue to grow my business. My experience with Used Vending has been fantastic. I had the privilege to work with Wendy, she was extremely helpful throughout the process which made the whole endeavor run smooth. I admit I was initially hesitant to use an online service to make this transaction but after speaking with Wendy, I understood the process and felt confident in allowing them to broker the deal. I consistently received quick response times, even after the final sale when I had additional questions Wendy was quick to respond. I plan on working with Used Vending in the future as I continue to grow my business. Thank you for all your help and I wish you and your company much success. Excellent service and follow-ups. Very professional personnel made the transaction easy. Wendy and Tonya were great. Thx so much! I would use their services again without a doubt. I want to thank Melissa on the Usedvending team. She helped me sell my concession trailer and handled the whole transaction very professionally. I would use their services again without a doubt. My buying experience was easy and pleasurable doing business with Bradley Heath. He kept in touch with me and the seller through the whole process, which made a smooth transition, as I was 850 miles away from the concession trailer I purchased. I would highly recommend doing business with Bradley and Used Vending. I recently purchased a truck through this site. Bradley Heath was extremely helpful throughout the entire process. Bradley went out of his way to make the transaction smooth and was there to answer all of our questions/ concerns at any time. Thank you for all of your help Bradley. It was 100% quick, easy and a great overall experience. I couldn't be happier with my experience with UsedVending.com. The hot dog cart I bought is in fantastic condition for a great price, and Wendy made the process seamless. It was 100% quick, easy and a great overall experience. 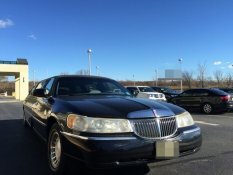 I've been looking for a while at multiple sites, and I'm glad I found what I wanted on UsedVending.com. 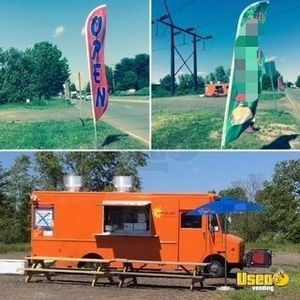 Recently I used Usedvending.com to sell a corn roaster. My broker Melissa did a fantastic job with communications between the buyer and myself and made things super easy. I would definitely use them again if the situation presented itself. ...satisfying experience and enjoyable one. My dealing with Melissa was the most satisfying experience and enjoyable one. She is a professional and prompt. Hi Jennifer, I just wanted to express my sincerest appreciation for your assistance in the consummation of my food trailer purchase transaction. You were extremely patient with me during my search of a food trailer. Notwithstanding same, you performed due diligence in following up with the search of the trailer that I wanted and at the price which I was able to reasonably afford, even when it had initially appeared that it was being purchased by another individual. Your perseverance was instrumental and I truly thank God for positioning you as the agent that facilitated a successful purchase transaction. May God richly and continually bless you and all of your future business transactions. 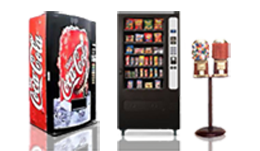 You are truly one of the best and Used Vending is blessed to have you as its agent! I will definitely recommend this website to anyone looking to sell or buy. ... the transaction was very smooth and fast. Working with your company was a great experience. Good Morning Melissa, Attached please find the signed Ownership Transfer of Goods form. The buyer saw the truck on Saturday, and the truck was paid in full. Thank you for all of your help. Working with your company was a great experience. It was easy to set up and the transaction process is well orchestrated. April, Using used vending.com was a great experience. It was easy to set up and the transaction process is well orchestrated. I will use Usedvending.com again. Our experience working with Melissa at USED Vending was great. We started working on getting a truck in the fall of 2014. I first spoke with Melissa then on our intentions to start our own business and the timeline for which everything would unfold over the next several months. Melissa & I touched based every so often along the way to discuss progress. When the time finally came for us to make our truck purchase , I felt like Melissa had our best interest in mind when helping to find the perfect truck. As it turned out, the perfect truck for us was half way across the US. Melissa helped the seller & I connect so that we could all work as a team to get the truck safely to it's new home in New Jersey. I could not have asked for a better experience in dealing with USED Vending or the seller. Making such a huge purchase can be a harrowing experience, but Melissa was there to answer questions and lend expertise at each turn. Thanks USED Vending! From inception to receipt of the trailer, it went like clockwork. I would like to leave a heartfelt thank you to your team. The experience I had, headed up by Crissy, was exceptional. From inception to receipt of the trailer, it went like clockwork. Crissy made it very easy, fast, and painless. Kudos to Crissy!! 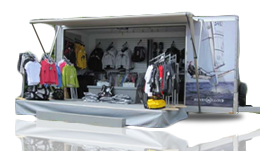 ...you and your company have made selling my trailer a dream experience. ...the transaction was a breeze. Melissa Powers with Used Vending has been working with me on my purchase. I really appreciated all her help in the purchase of the food trailer. With her help and knowledge the transaction was a breeze. I recommend them Very Highly, they are very professional at what they do. I would like to thank Melissa Powers for going over and above board to assist me in my recient purchase. She was super friendly and really did a great job when I ran into a little difficulty. I would recommend Melissa to anyone who asked me about this service.